During World War II, submarines discovered that they couldn't detect enemy ships. Something was interfering with their sonar. The cause? It was a 5 cm long shrimp with a 2.5 cm claw. Pistol shrimps have one normal claw and one oversized claw. The claw stays open until a muscle causes it to snap shut. When the claw snaps shut, a jet of water shoots out from a socket in the claw, at speeds up to 100 km/h (62 mph). Behind the jet of water, a bubble of air forms, called a cavitation bubble. When the bubble implodes, it produces a sound greater than 200 decibels (Human eardrums bursts at 150 decibels), thus immobilising its prey. This feat is pretty amazing, a 5 cm shrimp makes the loudest sound in the vast oceans filled with thousands of different species of animals. However, the pistol shrimps have an even more amazing feat. When the cavitation bubble bursts, not only does it make a loud noise, it also produces a flash of light which lasts no longer than 10 nanoseconds. The light is produced because the bubble is compressed so quickly that the air inside cannot escape. As a result, it becomes superheated, and the temperature of the bubble reaches up to at least 5000 degrees celsius. That's close to the temperature of the sun's surface! 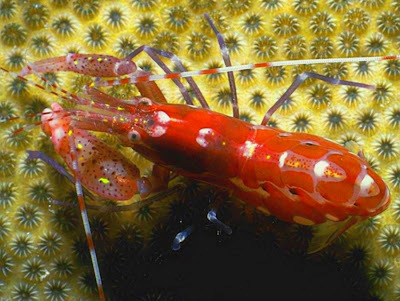 Pistol shrimps use their snapping claw to stun and kill their prey, and the pressure and the loud sound when the cavitation bubble bursts is able to stun and kill a small fish. When the snapping claw of the pistol shrimp is disabled or amputated, the other claw will grow in size to replace it. I think that the next time someone calls me a 'shrimp', I'll take it as a compliment!